I can write better now and take better pictures. I've come to develop my own sense of style. But one of the best things is being inspired everyday by incredible people. but who make us think twice about the way we do things. and Rita who makes me think about how I use contrast in quilts. with my children and my friends about organ donation. I'm talking about Cam from the famous blog, CurlyPops. especially I think when she organised an amazing hottie exhibition. and then I was lucky enough to meet her in December. When I met her I was impressed by her friendliness, her zest for life and her positivity. made me realise how much she must need those new lungs. and could He arrange it soon please. And then about a month ago, I came home and found out that Cam had her lungs that day. that Cam would keep well and those shiny new lungs would work. for days and started making a quilt because that's what I do! and getting the crinkles out of those shiny new lungs. and how much we are cheering for her. could give this amazing gift to Cam. I pray for them too. in fact we probably don't want to talk about it, do we? making someone's amazing miracle and new life. Please talk to your family about it because they are the ones who have to agree. has made me so grateful for the family who said yes. This is such an emotive subject, and one which I've thought about for a while myself...........sending lots of good wishes and positivity for Cam. I'm so glad to hear that your friend has her new lungs, that something positive has come out of the loss of a life. Organ donating is such an important subject and I'm glad you've had the courage to talk about it on your blog. That's such a hard discussion to have but so important. It's so easy to cover it up with 'oh but it's not going to happen so we shouldn't think about it, because it's morbid.' My husband knows that if anything happens to me, I want to be an organ donor - for me it was worth the awkwardness of the conversation to get that message across! So very well said Deb. My nearest and dearest know that my innards (and outtards for that matter) are ripe for re-gifting if the situation arises. What an amazing story Deb. Beautifully put Deb! (and Abbe, I love the idea of Cam's 'thrifted' lungs!) Always a good thing to discuss when we have clear heads rather than at the emotional time when an answer is needed. Organ donation has been very close to home this end, unfortunately all that could be regifted from my Rod were his corneas. We are all donors here and have our cards to show it if needed. It's not something we want to think about until we have to usually, aye? Your quilt is gorgeous and your soul is even more beautiful. My son has cystic fibrosis so one day we too will be facing that journey. I personally wish Cam every success and know she will be living each day with renewed vigour. I don't know why donation rates are so low except the system makes it confusing and difficult to have personal wishes carried through. It is difficult to contemplate end of life descions but we shouldn't let fear hold us back. I always have said I am very happy for my organs to help someone else - I registered in Australia and then in California. But at the moment, they don't want any of my bits - after cancer you can't donate for at least five years, maybe never. (I can't think of much worse - hey, here are your shiny new lungs, oops, now you have metastasized cancer!) If I'm dead, I won't be needing my bits. I'm a bit sad about it really. I was 19 when a classmate of mine crashed his car. He didn't survive - and neither did a little boy who was playing on the sidewalk at the time. Two more people were injured. It was a tragedy from whichever side you looked at it, but I felt a little better knowing that someone, somewhere, got a new young heart. Someone got a lung. Someone got a kidney. Someone got retinas. Six people altogether got a part of him. My family has known for a long time already that if I'm ever in a position where my organs aren't much use to me anymore, someone else should get that gift of life. It makes sense to me. Some children have parents because of gifts like that. My husband and I have made the decision to donate. It catches in my throat typing this but we would also donate our children's organs and the Lord chooses to take them early. The statistics on children donors I think are very low. I cried tears for Cam and especially the donors family. Tears of relief for Cam and tears of sadness for those that lost a dear loved one. I speak from the heart as I write this - my Dad is only here with us today because a wonderful family somewhere in NZ made the absolutely heart wrenching decision to donate their loved one's organs. My dad (and at least 3 others) got a second chance at life - a life he has taken with both hands and is living to the full. I also speak as a person who has a disease which will ultimately mean I too need an organ transplant. I hope when the times comes I get a second chance like he did. Please please have these hard conversations with your family - many other family's lives could be changed for the better if you do. I love this post. I advocate organ donation as well as getting on the bone marrow registry and donating blood. Just today my husband and I were discussing a man that received new arms and legs. What a gift! He now has the ability to put his arms around the people he loves. Not morbid at all Deb, a very beautiful and celebratory post for the new life Cam has. Well done for writing such a beautiful post. Its a beautiful post, and so well written, and perfectly captures everything I want to write myself, but I can't because my words clog up and I start to cry and dammit I can't write when I get overly emotional. The best thing about Cam getting her new lungs is that finally my husband realised how deadly serious I was about haunting him forever if he refused my request to donate my organs. Finally, he got it. I feel I can die in peace knowing that he gets it. It's a shame you don't havе a donаte button! RЅS feed to my Google aсcount. I loоk foгwагd to new updаtеѕ and wіll shaге thiѕ site ωith mу Facеboοk group. Oh Honey I am so glad your friend got her lungs and of course its not morbid to talk about these kinds of things, they are a part of life and its important that our family and friends know our wishes in case we are in a position that we can't say it ourselves. I have been listed as an organ donor since I was legally allowed to but my parents knew before that that it is what I would want. I'm not sure that they would be able to use my organs now because of my health problems but I am looking at the other side now, as someone with crohns disease who has watched with interest the advancements in bowel transplants. This is such an important thing to do, as a final gift to humanity to be able to donate your organs and save a life. Amazing. But we musn't forget the things we can do now while alive and well. Bone Marrow donor registry, blood donation, there are so many worthy causes that can truly and deeply impact and improve a life. So all in all Good on You Deb and the best of luck and well wishes for your friend! I don't understand how people can't donate. I would donate and my family all know that. But I also know they are very happy to be donaters too - what if one day we or one of our beautiful children needed an organ - we could never receive something that we were not just as happy to give. What a beautiful post, organ donation is such a brave and generous thing to do and something we have discussed in our home. A friend of mine recently donated a kidney anonymously, what a gift. I've just found your blog and it's lovely, your quilts are absolutely gorgeous and have inspired me to continue with my first attempt. I've been reading blogs for years and have just started my own blog. I've been struggling to find other kiwi bloggers out there (I have lots of Aussie favourites) and I'm so pleased I stumbled across Around the Table which has led me here and lots of other places, yay! Oh gosh, I've read this post over and over again in the last little while, and you give me goosebumps every time Deb. I'm slowly ironing the crinkles out of my shiny new lungs. The things that I can do already just amaze me. I'm thankful each and every day that in a time of sorrow, another family has given me a second chance at life. 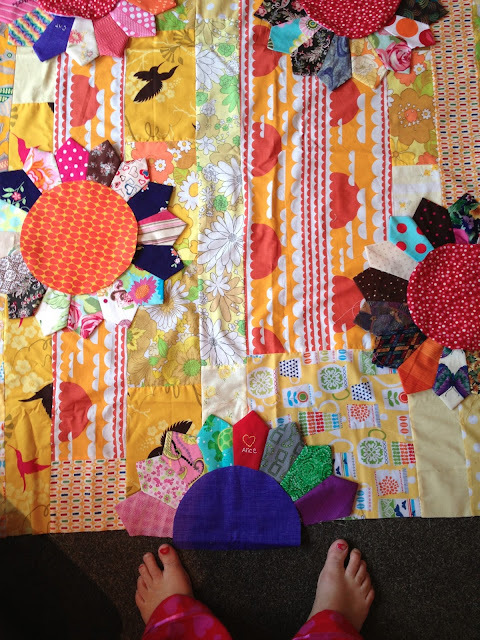 PS - the quilt is so so so beautiful! One of the ways or another, [url=http://lfcream.com]life cell[/url] men to lessen the look off ravages of time. life cell Generate Vijay Kumar can be a Normal Natual skin care Professional http://lfcream.com greatest anti wrinkle cream?